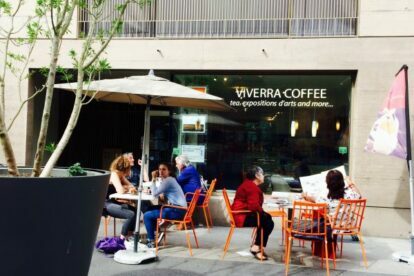 On my quest to find my new coffee spot, I stumbled upon Viverra. Viverra is right next to my house, which is a great plus. I like to get my coffee early in the morning on weekends and I don’t want to have to walk miles to get it. The owner, John, is warm and friendly and he will go out of his way to make your experience at his coffee shop as pleasant as possible. They serve authentic java coffee directly sourced from the Mountain Province, in the North of the Philippines. They have your usual pain au chocolat and croissants along with homemade quiches and bagels. The prices are actually truly reasonable for Geneva standards. They are conveniently located on a pedestrian street and therefore their terrace is really nice and quiet. The decoration is a bit bare and quite simple even though they have photographs and local art on the walls. But they have wifi and it looks like a good place to read a book or work on that book that you have been dreaming on writing your entire life. I really like the fact that all the customers of this place are regulars and seem to know the owner quite well. It gives the place a homey feeling. It creates a real sense of community, which is really pleasant. I truly wish more coffee shops would open in Paquis; it is a neighborhood with a lot of potential for growth and development.